How to make hamburgers? You might think as many do what kind of a question is that; throw a hamburger patty in the skillet or on the grill. It sounds simple but there is much more to making a good hamburger than that. 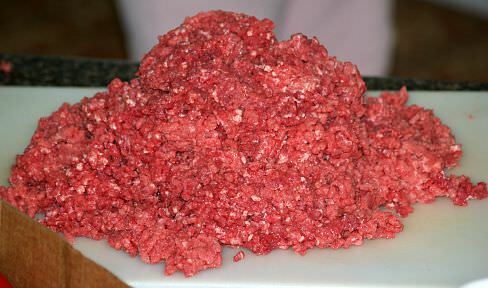 First when learning how to make hamburgers you will need to know something about the various qualities of the ground beef you will be using. Normally hamburger refers to the cheapest form of ground beef. 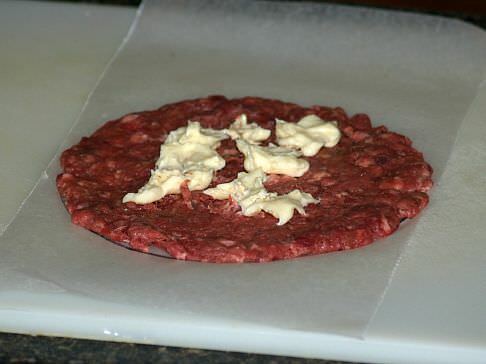 Although I will use this less lean ground beef in a few recipes like homemade salami (It is actually better for salami), I do not want to eat it made into hamburgers. Sometimes when you buy ground beef from the supermarket it will be labeled with the name of the cut like “ground round”. These extra lean cuts of beef produce ground meat which is EIGHTY FIVE to NINETY percent lean. This is very important when you are learning how to make hamburgers and is recommended for people who are on fat restricted diets and need to eliminate as much fat in their diet as possible. To many this quality is too dry for hamburgers. Personally I like it for hamburgers if they are flattened very thinly; they are like steak burgers. NOTE: When learning how to make hamburgers caution should be taken not to overcook very lean meat such as a patty made with the above mentioned lean ground beef. Ground beef made from the less tender cuts having less fat will be labeled “ground beef”. This quality of ground meat should be about EIGHTY percent lean. This meat is great and flavorful for hamburgers as well as meatloaves, meatballs, meat sauces and other dishes. The ground beef from parts with more fat will be labeled “hamburger”. This is the least expensive to purchase and SHOULD be about SEVENTY FIVE percent lean. I say SHOULD because I know much of what I have purchased never reached seventy five percent. This quality can be used in some recipes like sauces, chili recipes and as I said is actually better for salami because of the other ingredients in the recipe which absorbs the fat. Often these packages when buying will have a lot of white which shows the fat and often white gristle will be ground in it. I refuse to buy this quality for hamburgers; you usually loose the money you save in price by the shrinkage when the fat is melted. Now that you know about the quality of ground beef, it should help you learn how to make hamburgers to please your family and friends. Here are some other tips I can offer. I hate getting a “little” hamburger of a “big” bun. This is the danger of using a cheap hamburger to make the patties; they shrink a lot while cooking. Besides frying hamburgers in the skillet and cooking on the grill many good recipes are made by baking and broiling in the oven. Other ingredients are often added for flavor and moistness when making hamburgers. Do not be afraid to try something different; you might be surprised at the outcome. When I think about how to make hamburgers I always think about White Castle hamburgers. When I was little about one or two times a year (From 1950 to 1960 is when I remember) I would get to go to Cincinnati to visit my oldest sister, Lillian. There was a White Castle store down there and it was the ONLY TIME ever that we bought something out. (Dad’s saying was if we don’t grow it, we don’t eat it!). Although I am now told White Castle was the first fast food, it certainly was not “fast” back then. I remember standing in line with Dad or another sibling for a LONG time waiting while they cooked those delicious little hamburgers. Even back then I was so amazed watching them. How do you make White Castle hamburgers? They had large griddle equipment with large lids. They would place these large “sheets” of thin hamburger on the griddles; I think the hamburger was frozen. 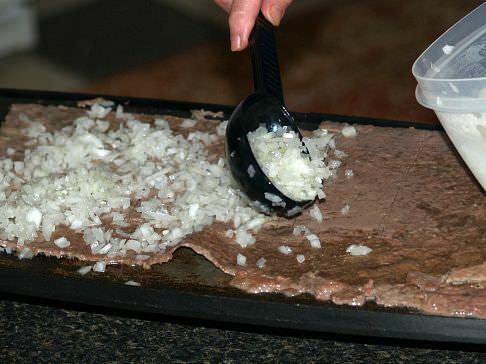 I remember they would close the lids briefly and when they lifted the lids, they would spread a large scoop of finely chopped fresh onion over the hamburger. It seems to me that somehow they could flip the hamburger over so the onions were on the bottom. Next they covered the entire hamburger with small dinner rolls and closed the lid again briefly. This step steamed the rolls making the onion flavor absorb into everything. After adding dill pickles, the little sandwiches were broken apart and “popped” into those little boxes. I was so enthralled that I could stand for hours and watch how to make hamburgers. I have been told and read a lot about how they make White Castle hamburgers. They always contain many fillers and really ridiculous ingredients. I do not know what is done today but I do know that was not the case back when I was young. One thing for sure I know these little “jewels” were made with a good quality hamburger. If they were not they could not have won the population over like they did. The farmers and other people like my parents were very “keen” on quality and would not have “fallen” so much for a food containing these fillers. Most would not even eat anything someone else prepared! I do not remember White Castle selling anything except hamburgers. Sandwiches are the only thing we ever bought; no French fries and no drinks. I do know they produced what seemed like hundreds of those little hamburgers very quickly and they smelled so good. I always wanted to learn how to make hamburgers like White Castles. The most amazing thing I remember about White Castle hamburgers was the price. I remember one time I was with Dad, he bought 2 dozen hamburgers (24 sandwiches) for only $2.00 and I remember him saying how the price had gone up. Can you believe? After this visit, I remember paying twelve cents for each burger and then I lost track of the price. Most times when we stopped by White Castle we could eat all we wanted; those were good times. I never saw anyone buy only one or two sandwiches; it was always by the full bags. Blend together all ingredients until well mixed. 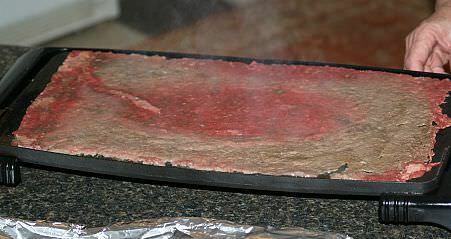 Roll meat out between two pieces of wax paper about ¼ inch thickness to fit griddle (You can use a skillet; it is all the technique). Place in the freezer until stiff. 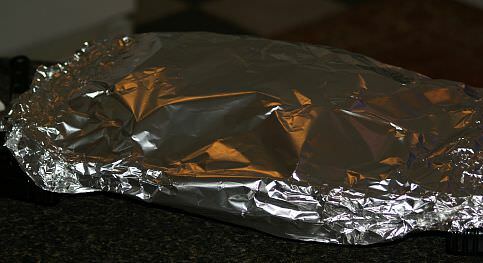 Place hamburger on the griddle and cover with foil. When thawed I cut in small hamburgers (To fit dinner rolls) with my pizza cutter. When the hamburger is cooked top with dinner rolls and cover again for about 3 minutes to steam. Add dill pickles and serve. You will want to master this simple technique when you are learning how to make hamburgers. These simple and plain burgers can be topped with anyones favorite toppings. Shape into 4 patties each about 1 inch thick. Arrange on broiler pan and place a few inches from heat. Broil about 8 to 10 minutes turning over once. If desired at end add cheese slice. When you are learning how to make hamburgers you will want to experiment with many different kinds of cheeses. Combine beef, onion, mustard, Worcestershire and pepper; blend well and shape into 8 (6 inch) patties. Set 1/3 of cheese aside; cut remaining cheese into 4 pieces. Place 1 piece of cheese on top of 4 patties; top with remaining patties and seal around sides. Cover patties and refrigerate until cold. Melt butter in a large non stick skillet over medium heat (I use griddle). Add mushrooms and onions, stir and cook until tender; remove from heat. Add remaining cheese to skillet stirring until cheese melts; remove from skillet and keep warm. Cook hamburger patties in skillet over medium heat about 8 minutes turning once. Remove hamburgers from heat and keep warm. 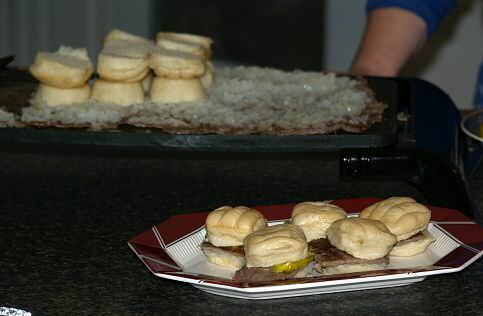 Brush cut sides of buns with olive oil; place buns cut side down in skillet and cook until light brown. Place burgers on bottoms of buns and top with remaining melted Brie cheese. 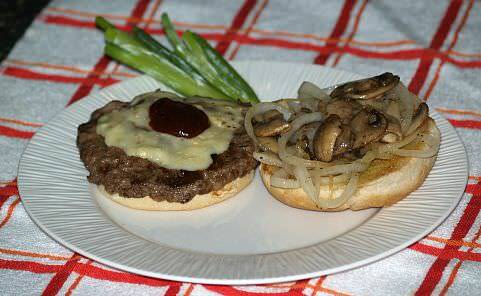 Spoon mushroom onion mixture over the burgers and cover with top buns; serve immediately. After you learn how to make hamburgers you will impress you friends and family with this tasty burger! Blend together beef, water chestnuts, bell peppers, onions, brown sugar, water, lemon juice, soy and ginger. Coat grill rack with cooking spray or oil; place rack over medium hot coals. Place patties on rack and cook without grill lid until done about 5 minutes on each side. Serve on buns with hoisin ketchup. Blend together mayonnaise and garlic; cover and refrigerate. Blend together beef, sausage, breadcrumbs, eggs and Worcestershire sauce. 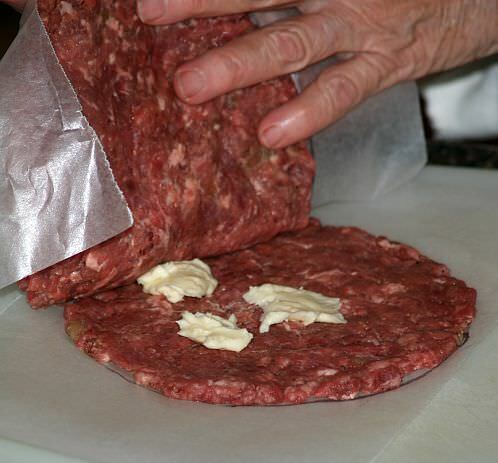 Shape mixture into 8 patties; cover and chill. Sprinkle green tomato slices with salt and pepper; dredge in cornmeal. Brown tomato slices in hot oil over medium heat; drain on paper towels and keep warm. 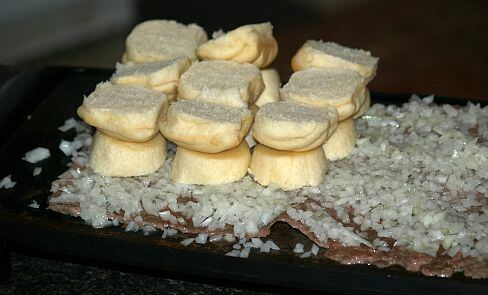 Line bottoms of rolls with washed lettuce and top with burger. 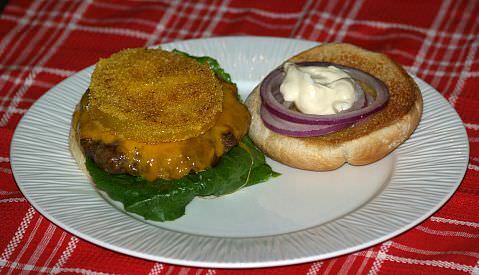 Top hamburger with slice of cheese, green tomato slice, onion slice and mayonnaise mixture. Top with other half of bun and serve immediately.